Optimal results in surface treatment are your goal. With the new BOGE Paintline, this is now possible in great quantities. 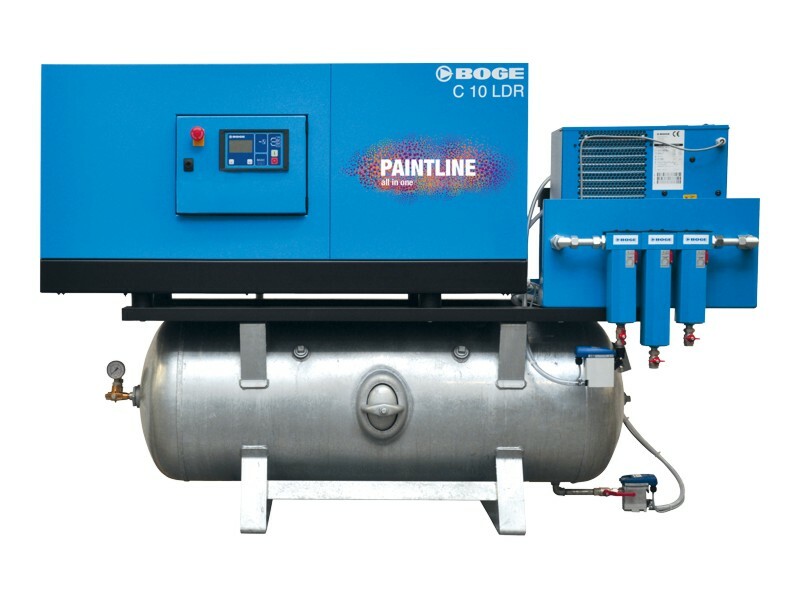 The BOGE Paintline generates and filters extremely pure, oil-free compressed air, with a performance range of 5.5 to 22 kW. The “all-in-one” compressed air system for high-quality surface coating produces compelling results in both trade and industry. Take advantage of the perfectly attuned system comprising compressed air generation, compressed air treatment and condensate disposal, in tried-and-tested BOGE premium quality. The ideal interaction between all of the components is what makes the BOGE Paintline so efficient and low-maintenance. And a high level of availability pays dividends, as you know! 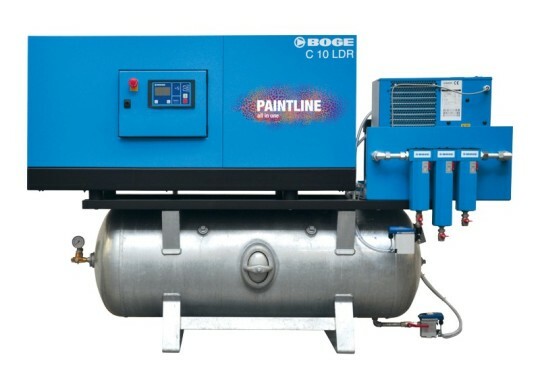 The basis of the BOGE Paintline is a C-series screw compressor in combination with a special filtering system. This enables you to achieve purity class 1 in the case of solid impurities and residual oil content, and class 4 in the case of water content. An oil-water separator is also integrated in the system in order to treat the oil-contaminated condensate. All of the components have a service life of at least 3,000 operating hours, which corresponds optimally to the servicing intervals of the BOGE compressor. The BOGE DUOTHERM heat recovery system can be integrated if required. BOGE supplies a complete system, with all of the components required for compressed-air generation and filtering. A perfect fit and ready for operation, without the need for time-consuming pipework or cabling. The BOGE Paintline system is based on guaranteed premium quality, through and through: all BOGE components are wear-resistant and maintenance friendly, since high quality and diligence take priority in the manufacturing process too. The optionally integrated frequency control and BOGE DUOTHERM heat recovery systems ensure that the BOGE Paintline operates with maximum efficiency. The BOGE Paintline’s activated carbon filtering unit has a service life of at least 3,000 operating hours and is also easy to exchange, since it is a cartridge-type filter system.